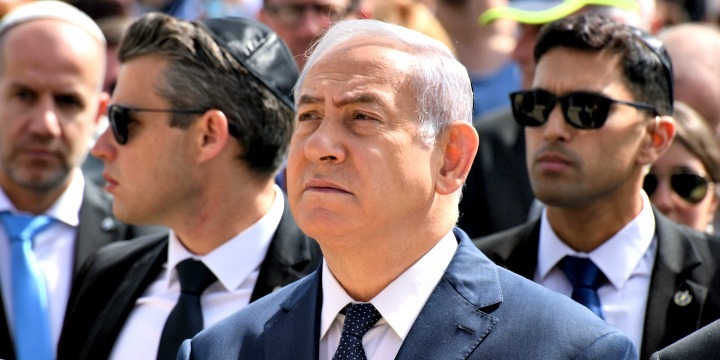 Israeli PM Benjamin Netanyahu attending the 2018 Yom Hashoah memorial service at Yad Vashem. Photo: Reuters / Debbie Hill. Sandwiched on the coast of the Baltic Sea between Russia to the east and Poland and Belarus to the west and south, all three countries emerged from more than fifty years of Communist rule as members of both NATO and the European Union. The invitation reflected Israel’s “increased standing in the world,” Netanyahu said. Among the items of Jewish interest on Netanyahu’s agenda are a visit to a synagogue in Vilnius — a historically Jewish city once dubbed “the Jerusalem of the north” — and a tribute at the monument to the victims of the mass killings in Ponary, a suburb of the capital. A total of 70,000 Jews were murdered by the German SS and their Lithuanian collaborators at Ponary, one of several killing centers used by the Nazis in the area of Vilnius. A full 95 percent of Lithuania’s 220,000 Jews were murdered in the Holocaust, along with 77 percent of Latvia’s and 35 percent of Estonia’s smaller Jewish communities. Having faced criticism for adopting what several leading Holocaust scholars criticized as an overly-conciliatory stance on Poland’s recently-passed controversial IPN Act, Netanyahu will have the opportunity to raise the distortion of Holocaust history in the Baltic countries at meetings with Lithuanian Prime Minister Saulius Skvernelis, Lithuanian President Dalia Grybauskait, Latvian Prime Minister Mris Kučinskis and Estonian Prime Minister Jüri Ratas. “The Israeli prime minister can do a world of good by politely bringing up three issues with his hosts in the Lithuanian government,” said Prof. Dovid Katz, an expert on Yiddish culture and Jewish history in Eastern Europe currently teaching at Gediminas Technical University in Vilnius. Katz told The Algemeiner that the first of Netanyahu’s requests should be “to ask for written apologies for three Israeli citizens, Yitzhak Arad, and the late Rachel Margolis and Joseph Melamed” — three Lithuanian Jewish heroes of the partisan struggle against the Nazis who later served in Israel’s 1948 War of Independence. All three, Katz said, had been “painfully defamed for posterity by Lithuanian prosecutors,” who falsely accused them of having participated in Soviet crimes against humanity. Earlier this month, Lithuanian Jewish leaders were among those protesting the government’s decision to honor Second World War resistance fighter Jonas Noreika with a commemorative plaque in Vilnius. According to research by his own granddaughter, journalist Silvia Foti, Noreika was “a brutal collaborator” who assisted the Nazis in the murder of thousands of Jews. “We are asking for the plaque to Noreika to be taken down before the Lithuanian Day of Remembrance of Jewish Victims of Genocide on September 23,” an Aug. 3 statement from the Jewish community said. Netanyahu, Katz said, had a “magnificent opportunity” before him during his time in Lithuania. “By standing up against the wholesale rewriting of history — including the state-sponsored effort to turn Holocaust collaborators into publicly honored ‘heroes’ — and by calling for the old Jewish cemetery, where some of his own ancestors lie buried, to be respected, [Netanyahu] will be demonstrating that Israel can have the best relations with East European countries without betraying its citizens, the truth of history and the Holocaust, or loyalty to elementary Jewish causes,” Katz declared.